Bienvenue dans l'un des plus belles plages au Belize! Bienvenue à Sarkiki Reef et l'une des plus belles plages de sable fin au Belize. Que vous rêviez de temps calme sur la plage, piscine chaude de l'océan, la plongée sur la deuxième plus longue barrière de corail du monde ou explorer les anciennes ruines mayas, Sarkiki sert de point de départ idéal. Notre grande 3 niveaux, respectueux de l'environnement, front de mer villa offre une vue imprenable sur l'océan de grandes terrasses sur chaque niveau et de l'océan et les montagnes depuis la terrasse sur le toit. S'il vous plaît contacter pour la disponibilité. Si cet appareil n'est pas disponible pour vos dates, veuillez consulter les listes VRBO 948361, 948364, 948365 également dans cet établissement. Les installations comprennent piscine fabuleuse de l'océan, 3 piscines, deux ponts et terrasse couverte, une grande terrasse commune, beach-volley, de la télévision et Internet. Pêche, plongée en apnée et la plongée sont facilement accessibles ou faire un tour de jungle de la rivière sur la belle rivière Sittee tous à proximité et facilement arrangé. Nous pouvons fournir un lit supplémentaire et / ou un berceau si nécessaire et sous réserve de disponibilité. S'il vous plaît nous contacter si l'un de ces éléments sont nécessaires. Pêche, plongée en apnée, la plongée et le kayak tous à proximité et facilement organisées. My wife and I spent a week at Sarkiki Reef in April and had a wonderful time. We had stayed here once before, several years ago, and were keen to come back. It did not disappoint! The condo is very spacious, on two levels, both with patios, and a third patio on the roof with great views out over the garden, pool, beach and the Caribbean. The line of tiny islands that make up the South Water Cayes was visible on the horizon. The condo is well equipped and had all the basics. The wifi functioned ok for basic purposes. The staff are excellent - friendly, courteous, helpful. If you want a fresh coconut straight from the tree, just ask! We ate breakfast on the patio each morning, and spent quite a bit of time at the pool, relaxing in the sun, swimming, and watching the iguanas. The grounds are attractive and well maintained. The beach is lovely. The sea is quite shallow close to shore, so you need to walk out until it is deep enough to swim. Since our first visit the Mango beach bar has opened right next to the Sarkiki complex. It's very quiet and casual, and we made good use of it. The marina is close by and there is a good restaurant there, too. Otherwise the condo is some distance south of the main village, shops and facilities of Hopkins. We rented a car and drove from Belize airport (approx two and a half hours), and were glad to have our own transportation. We spent two days diving and snorkeling with Seemore Adventures (their little office is one of the first buildings you come to when you drive back into Hopkins (as long as you ignore the one-way signs!!) We also spent two half days in the nearby Cockscomb Forest Reserve and the Mayflower Bokawina Reserve. Lovely tropical rain forest scenery with some great walks. Sarkiki is definitely one of our favorite places, and we hope to be back again. The accommodations were great and the staff at the resort are wonderful. If you are looking for a great jump off point for day trips around Belize and an amazing pool and beach to return to! Perfect location, beautiful beach, pool! Very nice condo! Go, you will love it! It's a lovely place, great beach and very nice management on-site to assist guests. 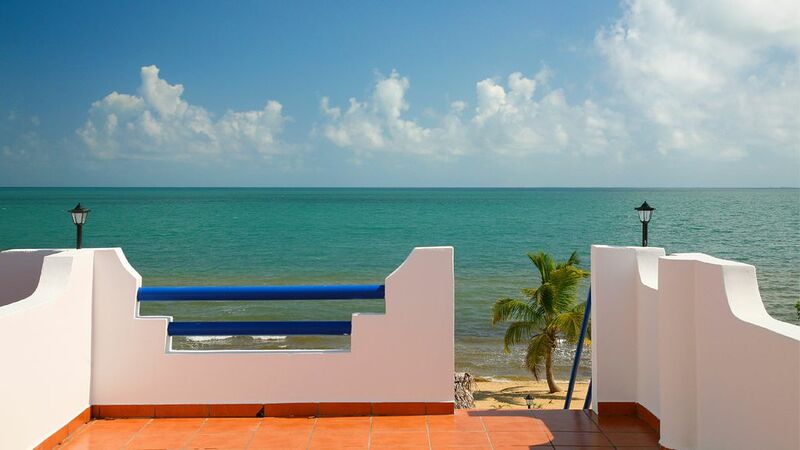 The property is located on a great beach which was cleaned daily by the crew on-site. All 3 pools worked perfectly and they were cleaned daily as well. The garden is well maintained and the on-site management is very accommodating and helpful. The apartment had the basic items supplied such as towels, plates, cups etc. but nothing more. The apartment inside needs some updating, fresh paint etc. My only negative comment is that any other properties we rented so far through VRBO were very cozy and had personal touches of the owner - so was this one on the pictures with painting on the wall, flowers and decorations. In reality, this apartment has absolutely zero decorations, no pictures on the wall, nothing other than the basics. It did not feel like a VRBO experience. Still, we had a great time. Couldn't have chosen a better spot in Hopkins! We stayed at Linda's property for ten days, and loved every minute. During our time in Hopkins and exploring Belize more broadly, we couldn't identify a single other place where we'd have rather stayed. We really appreciated that Sarkiki felt less "resorty" and more down-to-earth (in a good way) than some of the places in the area. The apartment offered plenty of space for three people (one couple and one solo), and definitely could have handled more. The site is gorgeous: pristine beach, lovely landscaping, refreshing pools... We often had morning coffee and dinner out on the balcony, enjoying the beautiful sunrises and starfilled skies. The staff are incredibly friendly and helpful, and Linda and Mike offer great recommendations on things to do in the area. The spot is a little south of Hopkins, which we preferred to being in the thick of the touristy areas. We rented a car from Hopkins Auto Rental (they are great! ), which made it easy to get into "downtown" Hopkins and to explore the rest of the region. The dirt road is a little bumpy, but we actually liked that--it forced us to slow down a little and focus on our surroundings, and allowed us to wave at everyone we passed, which is a delightful norm in Hopkins! From Sarkiki, we very easily did the following activities, among others: four days of diving with Seemore in Hopkins, ziplining and waterfall rappelling at Bocawina National Park 40 minutes away, a waterfall hike in Cockscomb Preserve, and a guided tour of Xunantunich Mayan ruins. Thank you, Linda and Mike, for a wonderful and memorable stay! Your review captured our property, Hopkins and Belize perfectly. Hopkins is a friendly village and we are happy to be a bit south out of the busier, touristy area. I am always happy to answer questions whether in person, by email or phone. We hope to see you again. We had a great stay at Sarkiki. Mike and Linda were really great, and we loved the place. Epi, Manuel, and the rest of the team could have been more friendly and helpful. Thank you and we hope to get back again soon! Rates are subject to change until booking confirmed with deposit.